An article in the New York Times paints a compelling picture of the shifting landscape for utilities as natural gas slowly begins replacing coal as the prudent choice for power generation. With the death of carbon legislation, this shift will happen more slowly, but it will happen. Coal won't go away, but it gradually will lose market share. While people wag on in different directions about the impact of carbon on the climate, the unavoidable fact is that burning coal emits other dangerous pollutants such as mercury, sulfur dioxide, nitrogen oxide and particulate pollutants. There are scubbers that can reduce (not eliminate) the impact of these pollutants, but retrofits are expensive. especially when a large portion of the coal power infrastructure is as old as it is. An editorial in yesterday's Shreveport Times clearly stated the best course for the future of drilling and exploration in the Haynesville Shale. It can be summarized in one word: balance. The issue of mineral exploration has many sides, but the extremes often find the large and eager audiences, from "drill, baby, drill!" to "frack no!" But what often gets lost in the rabble is the middle ground where the rest of us live. The reality is that we need fossil fuels to run our country and the best place to source them is right here at home. But what's the best way to achieve both of those goals? Answer: we have to balance the need to drill, with its related benefits, from jobs to wealth creation, against the need to protect the environment and maintain favorable living conditions. 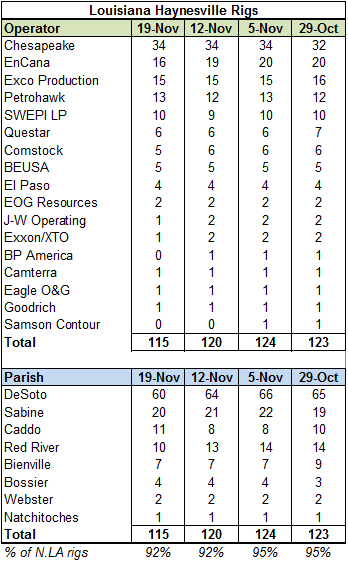 This week, the Haynesville rig count increased by two to 158. Louisiana held steady at 115 while Texas increased by two to 43. 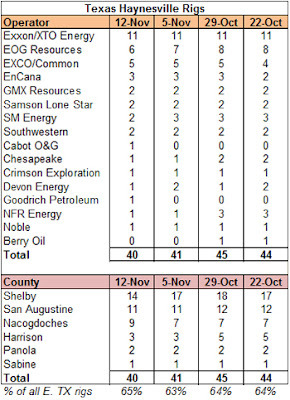 This latter is rather surprising given the fact that the overall east Texas rig count was down by three. 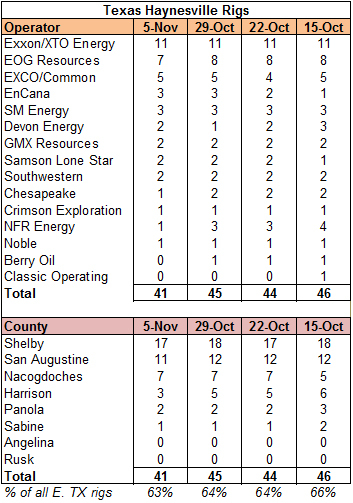 Haynesville drilling in east Texas (District 6) this week represents 74% of the working rigs, up from 67% last week. What may be more surprising is that the two new rigs are drilling in Harrison County, which had pretty much been left for dead of late. Thanksgiving means something different to everyone. I can be something of a complainer, but on Thanksgiving I try to take some time to reflect on the things for which I am truly thankful. Like many others, I am the beneficiary of gifts - direct and indirect - that have shaped my life. While I tend to be a lone wolf, I am also the recipient of much help and guidance from others. Nobody is truly alone in this world, and I am thankful to those who have helped me, either overtly or through an invisible hand. I am thankful for the safe arrival of our second child and the continued happiness my little family. I am thankful for the good (and improving) health of those close to me. I am blessed to have had good opportunities in life and I hope to create new and wonderful things as a means of acknowledging these gifts. I am also thankful for those out there who have followed this web site. While I consider this a self-indulgent project, I get really jazzed when I hear from readers. (I guess I'm thankful I don't get more hate mail.) We live in exciting times. As long as we keep our eyes on the horizon, continue to do good work and proceed cautiously through the negativity, we will be alright. While financing is an important hurdle, the facility must also get a number of regulatory approvals before construction will begin. Building an LNG export facility is a long-term project and will not help solve the current imbalance in U.S. natural gas supply and demand that has crushed prices, but it does bode well for the future of natural gas in this country. "The shale boom has made the country the world’s biggest natural gas producer, with 57bn cu ft a day of output, according to Nikos Tsafos of PFC Energy, the consultancy. If the US exported just a 10th of its gas last year, he says, it would have been the world’s top LNG exporter." In a move that should surprise nobody, Exxon announced yesterday that it is suspending work on its planned Blue Water Energy LNG plant off the coast of New Jersey. Why did it take so long to make the decision? Seems like a no-brainer on the surface. I can't say for sure, but I think it speaks to Exxon's belief in the potential for North American shale gas (as if its $36 billion acquisition of XTO Energy last year wasn't enough evidence) and in the viability of the Marcellus Shale. Because of its concentrated population, remote coastal location and its high levels of gas use, the Northeast is one of the few areas of the U.S. that imports some natural gas from other countries. The Marcellus Shale is the largest gas shale deposit in North America, but perhaps what makes it really attractive is its proximity to the Northeast gas markets. But if exploration in the Marcellus is limited by local politics for more than a decade, an LNG port off the coast of New Jersey would make sense. I guess not any more. Exxon is a company that makes well-considered decisions, so I view this as another ringing endorsement of the future of shale gas. Gregory Kallenberg's documentary "Haynesville" will play on CNBC tonight three times, 9:00 p.m., 10:00 p.m. and midnight (central). 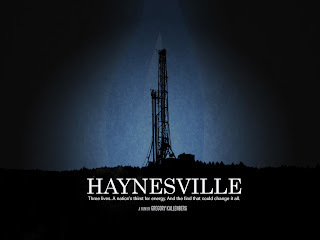 It will show again on Sunday at 9:00 p.m.
"Haynesville" follows three people in the early days of the Haynesville Shale as they deal with the potential economic windfall that comes with drilling the shale under their feet. It is important to remember that the film is a documentary and not a debate about the pros and cons about modern drilling. If it had been completed later, the hydraulic fracturing hysteria would be unavoidable, but the film predates the fracking histrionics. Is this the face of compromise? I think not. Russian media reported last week that the country's energy giant OAO Gazprom will not provide its European partners with a price break even though it is selling into a market with lower demand and higher supply. Russia provides around a quarter of Europe's natural gas through long-term contracts with prices pegged to the price of oil. In recent years, thanks to massive LNG projects in Qatar and the advent of shale gas in North America, there is a new spot market for gas developing in Europe with lower prices than those in Russian gas contracts. As a result, pressure has grown for Russia to make price concessions. Russia has resisted taking the first step down this slippery slope. The news comes in the context of Russia's price negotiations with Belarus, the former Soviet republic that now enjoys the lowest Russian gas prices. It also coincides with the arrival of the first LNG shipment from the United States (a re-export from Cheniere's Sabine Pass facility). Only time will tell if Russia's resistance to price compromise will be a good strategy. 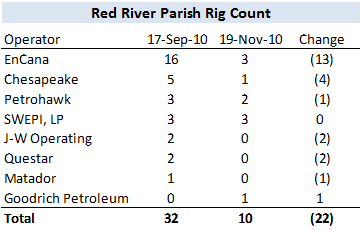 Perusing the declining rig count in Louisiana, it is pretty easy to tell from where the rigs are disappearing: Red River Parish. 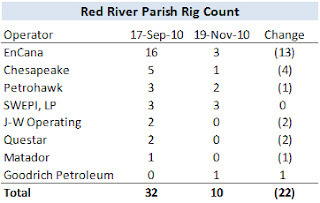 Over the course of two months, from September 17 to November 19, 2010, the rig count dropped by 22, from 32 to 10. Over that same period, the total Haynesville rigs in Louisiana dropped by 15, from 130 to 115 (the peak was July 30 at 136). What's changed? 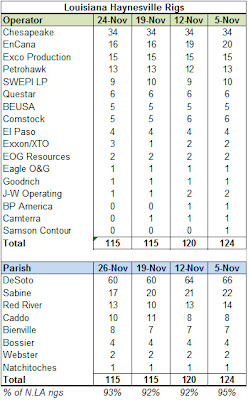 Looking at the operators, the big change is that EnCana moved 13 of its 16 rigs out of the parish. That trend somewhat mimics EnCana's Haynesville rig count over the same two month period, which has dropped by ten, from 26 to 16. The Haynesville Shale working rig count took another dip this week, dropping by four to 156, the lowest count since February 5, 2010. 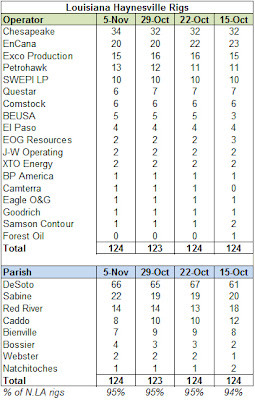 Texas saw a one rig increase while Louisiana dropped five rigs. The weekly Baker Hughes rig count showed an eight rig decrease to 1,677. 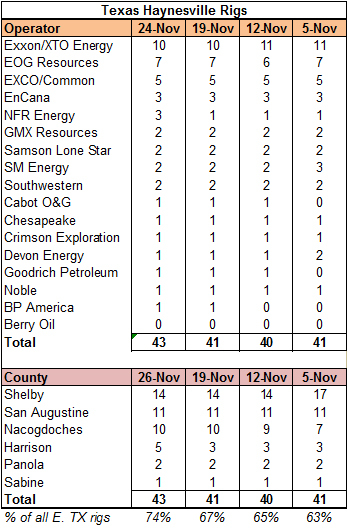 Since last week's figure of 1,685 was the high point for the past 12 months, rig counts are still pretty high. Behind the numbers, gas rigs dropped by 19 to 936, which is 5.6% off the 12 month high point achieved in mid-August, while oil rigs increased by 11 to 731, the highest number for the past 12 months. By type, there were eight fewer horizontal rigs, four fewer vertical rigs and four additional directional rigs working. 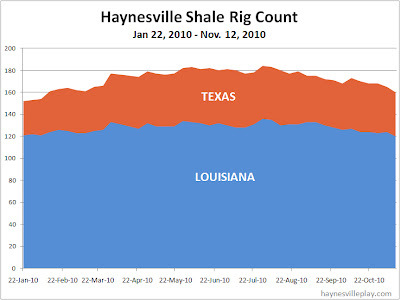 In the Haynesville region, inclusive of other formations, the rig count dropped by six to 186. 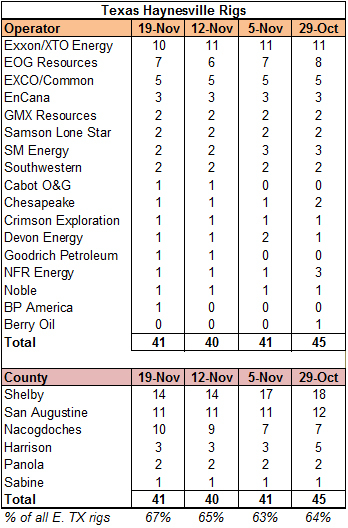 Working rigs were down five in north Louisiana (125) and down one in east Texas (61). Maps and completions spreadsheet have been updated. The weekly EIA working gas in storage report showed only a 3 Bcf increase last week, bringing the total gas in storage to 3.843. The current storage figure is a record high for the week, but only by a whisker (13 Bcf) over last year's level, but it is 9.3% higher than the five year average for this time (3.516 Tcf). The weekly injection was considerably lower than last year's (+21 Bcf) and the five year average (+18 Bcf). Average temperatures across the country were just slightly above normal, but as the map below shows, the average was misleading because there was significant fluctuation by region. The long-awaited legislation to promote natural gas use in vehicles was temporarily stalled by its sponsor Sen. Harry Reid (D-NV) as he negotiates for more bipartisan support to get the bill passed. With the tumult in Congress after the recent elections and the other priorities of the lame duck session that started this week, the NGV legislation is the only energy bill with a hope of passing. While Reid is working to get more Republicans on board, he is also getting push-back from within his own party. Among the offenders is Sen. Tom Harkin of Iowa who wants to add support for biofuels to the bill. Adding ethanol to a bill about natural gas would be a travesty, a classic two steps forward, one step back move. Hopefully Harkin's vote won't be needed to pass the bill. Unfortunately, as politicians start to focus on the 2012 election cycle, prospective presidential candidates will start to visit Iowa again (Newt Gingrich is there this week) and fall under the spell of converting perfectly good food into vehicle fuel. Of late, the ethanol folks have been pushing for an E-15 standard to increase the potential ethanol component in gasoline from 10% to 15%. The attempts failed after the 2008 election was over, but the campaign likely will get more attention with 2012 coming. The audience for Gregory Kallenberg's documentary "Haynesville" will grow exponentially on November 23 when it premieres on CNBC at 9 p.m. EST/8 p.m. CST. It will be replayed 10 p.m., midnight and 1 a.m. It will also be played on Sunday November 28 at 10 p.m. EST/9 p.m. CST. Congrats to the "Haynesville" team - break a leg! I tried to keep an open mind when viewing the piece on shale drilling on Sunday's "60 Minutes" program. In all, I found that it was fairly objective but it fell victim to the big logical fallacy being perpetuated by anti-shale advocates that hydraulic fracturing has caused the recent gas-related incidents in Pennsylvania. Because the point of departure for the piece was the new wealth created for landowners, specifically in the Haynesville Shale, at least the story had some hoofing to do to get to the gripes of the anti-shale folks (much to the chagrin of people posting complaints on the "60 Minutes" web site). Since most stories seem to start with the negative view, that change in perspective was refreshing. To me the wealth creation is one of the least effectively told stories out there. Not just the million dollar checks but the opportunity for normal folks to earn a residual on their land so that they can continue to farm and pursue other interests without the land ownership being a burden. I predict this will be an even bigger story in the Marcellus Shale. I'm glad the producers didn't go overboard in trying to portray TX/LA residents as the "Beverly Hillbillies," but they did have the obligatory, patronizing gold Cadillac shot. The weekly Haynesville Shale working rig count continued to decrease this week, dropping by five rigs to 160, its lowest level since early February 2010. The count dropped by four in Louisiana to 120 and by one in Texas to 40. Rig count spreadsheets and maps have been updated. While it is difficult to assess trends on a weekly basis, it does seem clear that the Haynesville rig count peaked July 30 at 184 and that we are definitely witnessing a downhill slide. I think the decline will be gradual for the next year, but if natural gas prices don't improve it will be dramatic at year end 2011. The weekly Baker Hughes rig count showed a two rig increase to 1,685. Gas rigs held steady at 955, while oil rigs increased by two. By type, vertical rigs were up by 14, while directional rigs decreased by nine and horizontal rigs decreased by three. Even with the drop, horizontal rigs still represent 55.8% of the rigs operating today, compared to 46.5% this week last year and 32.1% this week two years ago. 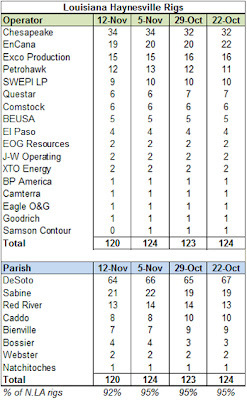 In the Haynesville Shale region, inclusive of other formations, the rig count dropped by four to 192. 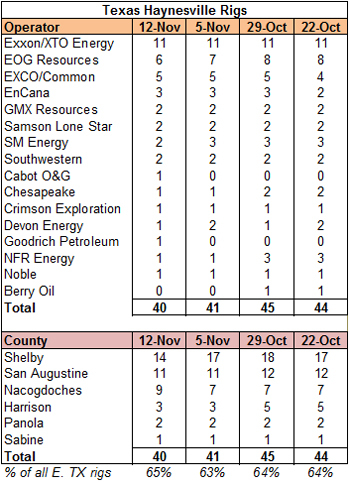 East Texas dropped three rigs to 62, its lowest level since January 22, 2010, while north Louisiana dropped one to 130. Oh, how times have changed! I read through the Chesapeake Energy third quarter earnings call this afternoon and there was not a single mention of the Haynesville Shale in the script or the Q&A. It sort of hurt my feelings. This from the company that frequently touted its "discovery" of the Haynesville Shale just two years ago. I guess every flower must fade, but my guess is that when gas prices recover, Chesapeake will be back knocking on our door once again wearing a crisp suit carrying bouquet of fresh flowers and a box of chocolates. What will we say to our admiring suitor then? 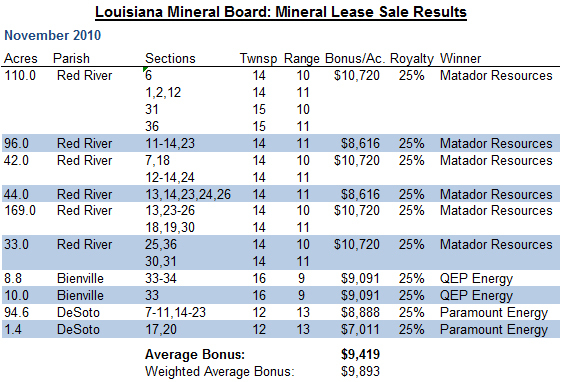 The Louisiana Mineral Board held its monthly lease sale yesterday, and properties in the Haynesville Shale region generated an average lease bonus of $9,419. The weighted average considering parcel size was $9,893. This average is roughly double the lease sales for the past couple of months, but it likely is more a reflection of the quality of the acreage than some overall change in market sentiment towards value. What is certain is that the prolonged downturn in natural gas prices has not reduced the buy/sell activity in the mineral lease market. The difference now is the valuation of the properties. 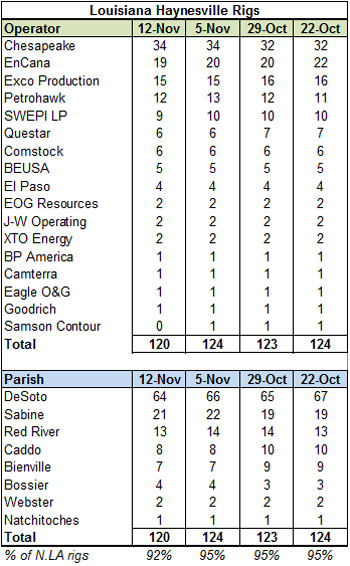 Here is another batch of 19 LA Haynesville completions to go along with the ones posted Tuesday. The map and spreadsheet have been updated. This weekend, a shipment of LNG will be re-exported from the U.S. to Great Britain. While only a drop in the proverbial bucket of worldwide natural gas supply, it is a symbolic shipment because the gas shipped to Britain can be piped directly to Northern Europe via a pipeline to Belgium and distributed to customers that have long been held captive by Russian natural gas and its oil-indexed pricing. The article linked above has more details, but it is yet another indication of the widespread impact of North American shale gas on the worldwide natural gas market, including further erosion of Russia's clout in Europe. Whew, a little relief from the weekly storage report. The EIA reported that storage increased 19 Bcf last week to 3.84 Tcf. It s a record high level, but the weekly injection is less than the 23 Bcf injection expected by analysts. The weekly injection was 24% lower than last year's (+25 Bcf) and 37% lower than the five year average (+30 Bcf). The current storage level stands 0.8% above last year's record figure and 9.8% above the five year average. For the first time in a month, temperatures were slightly below the norm for the week. The soothsayers at the EIA released their monthly short-term energy outlook. In it, the governmental agency lowered its estimate for the average natural gas price for 2011 to $4.31/MMBtu. That's a decrease of 27 cents from last month's estimate. In terms of gas in storage, EIA estimates that this November will see a net 3 Bcf decrease. That implies there will be some more injections before the withdrawals start, not really a surprise. EIA also estimates that storage levels in March 2011 at the end of the withdrawal season will be a patriotic 1.776 Tcf. That's 114 Bcf higher than 2010's trough number. This and $2.50 will get you a short latte at Starbucks, but it's always interesting to watch the accuracy (or lack thereof) of projections. Never let it be said that I don't read my email. By popular demand I will start including survey information (survey name and abstract) in all new Texas completions and developmental activity posts, starting with yesterday's post. I will work diligently to collect this information for all of the wells on the completions spreadsheet, but it might take a while. I'm already working on collecting latitude/longitude data so I can create maps of the Texas data, but since it is a time-consuming, manual process, I'm only about halfway done with the first project. I hope to have both done a month or so, unless outside obligations absorb all my time. I arrived home this evening after a somewhat late dinner with my wife to find my Sunday New York Times sitting on my porch (it wasn't that late of a dinner). I perused it quickly (sports first, business second) and found an article about the Haynesville Shale on the first page of the business section. The article is not terribly enlightening to anyone who follows shale drilling, but it draws an interesting (although somewhat incomplete) parallel between the relative comfort that Louisianans (and Texans) have with gas drilling compared to the fear that residents of Pennsylvania feel. Interestingly, the article failed to point out that while there has been gas drilling in Louisiana for the past 100 years, there actually has been gas drilling in Pennsylvania for the past 151 years. After an election cycle filled with fear-mongering, fear seems to be the dominant currency of public expression. Fill people with feelings of uncertainty and dread and they will become an army of cooperative minions. That has been the model in the Northeast, where people are deathly afraid of hydraulic fracturing because they think it will ruin their drinking water and kill their pets. These fears are ironic given the terrible surface and groundwater pollution that coal mines have caused in the region for generations. I scratch my head about this all the time. Why do they get so worked up about gas drilling when coal mining is so much worse? Last week, I was watching a special about the history of Halloween when it struck me that the big difference is the Bogeyman. The Bogeyman became a common device used to generate irrational fear in an audience. Concepts can be scary, but when you can focus on one particular person or thing - the Bogeyman - you amplify the fear exponentially. In this case, hydraulic fracturing is the Bogeyman for the natural gas industry, while coal mining doesn't seem to have one. It's easy to point to fracking as the evil, even when you can't substantiate that fracking has ever caused any environmental damage. With coal, there may be this amorphous cloud of evil, but there's no handle, no foothold, nothing to grasp. With fracking, you've got something on which to hang your proverbial hat. Even the word "fracking" sounds evil and dangerous. Clearly it was not coined by the marketing and PR department. I don't offer any solutions at this late hour, only observations. Just mind the Bogeyman - his bark is definitely worse than his bite. The weekly Baker Hughes rig count showed an 11 rig increase to 1,683. Oil rigs increased by 22 to 718, while gas rigs decreased by 11 to 955. Miscellaneous rigs increased by one to 10. By type, horizontal rigs increased by 24, while vertical rigs decreased by 11 and directional rigs decreased by two. In the Haynesville Shale region, inclusive of other formations, the rig count dropped by five to 196. 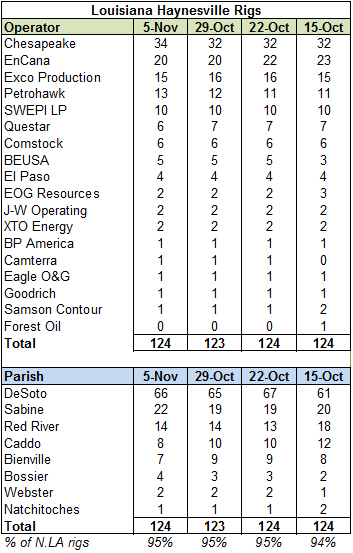 The north Louisiana rig count increased by one to 131 while the east Texas rig count decreased by six to 65. Detailed Haynesville Shale rig counts should be available late this afternoon. EOG released its third quarter earnings yesterday. EOG was an early adopter of the "shift to liquids" strategy and is of the belief that 67% of its production in 2011 will be oil and natural gas liquids. The company now proclaims itself a "North American Oil Company." Good for them. But EOG still has around 160,000 net acres in the Haynesville Shale. Trying to put a happy face on this, the company touts that 67% of its acreage is in the sweet spot of the play, a higher percentage - it claims - than any other major leaseholders in the play. The big news from EOG is that the company will pull back on its capital spending for 2011 and 2012. There were no hard numbers, but the strategy will be to drill the sweet spot acreage and little else. The company claims to have little remaining acreage that is not held by production (HBP). Devon Energy held its third quarter earnings call today. There was little discussion about its Haynesville Shale activities - because Devon has done little to develop its acreage - but management did mention that it was considering selling a portion of its less profitable acreage, up to 17,000 acres. Last week, the company announced that it had farmed out 5,470 net acres to Sun River Energy. Yikes! 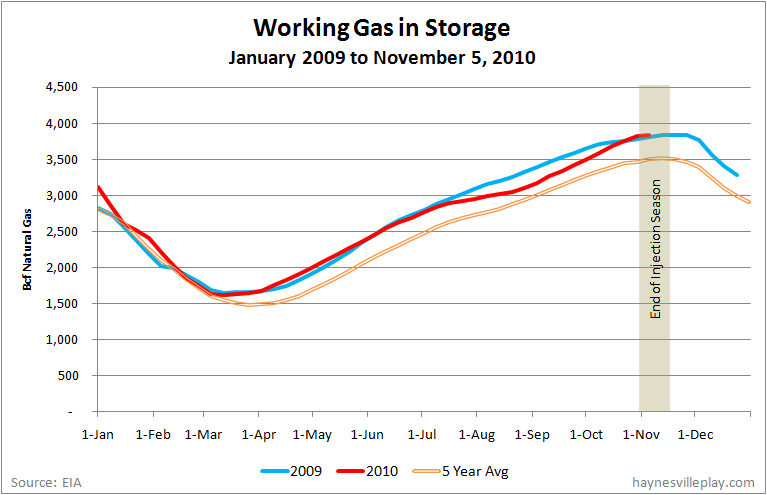 The EIA reported that the current working gas in storage levels increased 67 Bcf to 3.821 Tcf. The current storage level is now even higher than last year's record level! The weekly injection was 2.3 times greater than last year's (+29 Bcf) and 2.6 times greater than the five year average. The current storage levels are now 1.0% greater than last year and 10.2% higher than the five year average. Given the late run in storage buildup and the projected mild winter, it is going to be hard to bleed down storage levels to a decent starting point at the beginning of next spring's new injection period. I guess the good news is that the current low price of gas will help lead to some temporary fuel switching from coal at many utilities, which will push at least a little more demand. 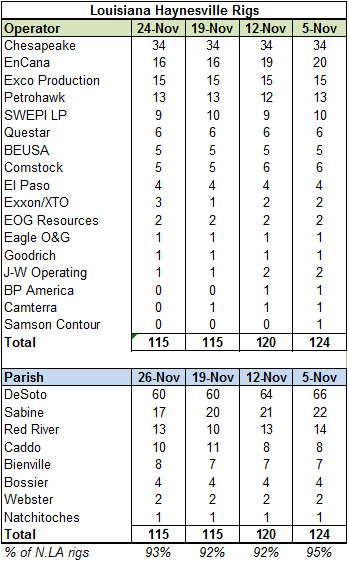 Operating 21 rigs in the play and will end the year with 22 operated rigs. 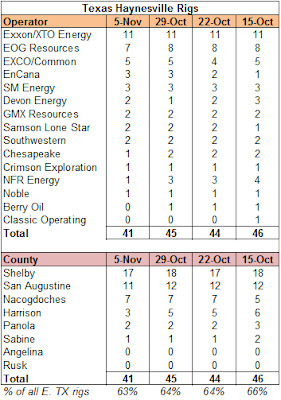 Five of the rigs are operating in the Shelby Trough, mostly in San Augustine Co. Half of the company's rigs have less than one year remaining on lease term, which gives the company the flexibility to lay down rigs if prices stay low (and lease retention plan is on schedule). Spud 28 operated wells in Q3 and completed 23. It is on target to spud approximately 126 operated horizontal wells in 2010. Operating three dedicated fracture stimulation fleets, so it has not seen its inventory of drilled-but-not-completed wells swell. 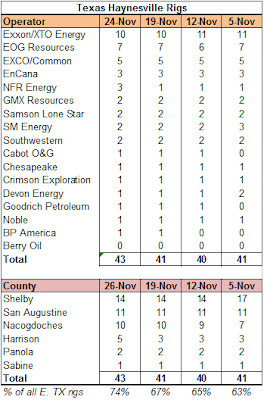 There are currently 12 wells awaiting completion, which is low compared to competitors. Testing a restricted choke program but provided few details. It is still experimenting with completion optimization, testing frac designs, the number of frac stages as well as size and type of proppant materials. Drilling costs decreasing: current drilling costs per well is around $9.25 million, with a target of $8.75 million in 2011. As noted previously, EXCO has stopped drilling in locations where it doesn't expect a 20% internal rate of return at $4.00 gas prices. Management now owns 15% of the company - that's big because they likely will roll their equity into the transaction, limiting the equity cash that needs to be raised. It also is a possible impediment against outside bidders. Nobody wants to bid against management. It might also keep a lid on the offer price of $20.50 per share. CEO Douglas Miller took EXCO private in 2003 in a similar transaction. It reemerged three years later as a public company. Sensing a trend? T. Boone Pickens, who is being courted by Mr. Miller to partner in the transaction, was a partner in the earlier transaction and owned 13% of the company when taken private the first time. He still owns a big chunk of EXCO stock. Second verse, same as the first. Cabot Oil & Gas reported its earnings last week. As with most other companies, Cabot didn't spend a lot of time talking about its Haynesville operations. Dry gas has become very unpopular - oh, how things have changed! By my tally, Cabot hasn't operated a rig in the Haynesville Shale since May 2010, but the company is still obligated to spend money on non-operated wells in which it owns a working interest. The company has a 10-20% interest in 16 non-operated wells in various stages of drilling or completion. As with everyone else, Cabot is seeing higher costs, especially from pressure pumping. As a result, Cabot is seeking a 33% working interest joint venture partner for its Haynesville interests to help bear the load. The company is already in discussions with unnamed parties and has a bid deadline of December 15. In its earnings release today, Forest Oil was largely silent on its Haynesville Shale operations. The company has three "core" areas in Red River Parish, Sabine Parish and Shelby Co./Panola Co. along with Cotton Valley/Haynesville acreage in Harrison, Gregg and Rusk Counties. The company announced that it does not plan to operate a rig in the play for the rest of 2010. It declared that its acreage in Red River Parish is now held by production, but it did not mention progress in its other core areas. Forest did note that the company has started using the restricted choke technique to optimize gas recoveries and has completed its most recent three wells with restricted chokes. 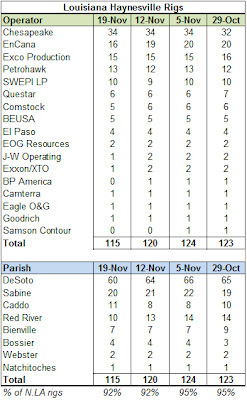 While it provided little detail, the company has observed that after 90 days cumulative production from the restricted wells exceeded that from the unrestricted wells. Not bad. Haynesville production averaged 434 MMcf/day for the third quarter. That represents around 63% of the company's total daily production. The Eagle Ford Shale is picking up, but it's got a ways to go to catch up. Petrohawk drilled 29 operated wells and participated in 72 non-operated wells for a total of 102 drilled wells in the quarter. In reading a New York Times article on the potential acquisition of EXCO Resources proposed by its Chairman and CEO, I was struck at the difference in how the public markets and private investors value companies. The article notes the "rich premium" of 38% being offered for EXCO's stock. Sure, that's rich compared to last Friday's closing stock price of $14.83., but the 52 week high for the stock is 52% higher than Friday's close. It begs the eternal stock market question, is EXCO really worth around half of what it was worth ten months ago? As the clever people say, herein lies the rub. A private equity investor is going to look at EXCO and value the company based on its long-term prospects. The private investor looks at the short term issues (commodity prices, natural gas supply/demand, the company's capital structure, its debt maturities, profitability, etc.) but those factors are not the prime drivers of valuation. You never want to pay too much going in, but is the stock market accurately valuing the company? The stock market tends to take opposite approach. Short-term issues drive investor sentiment. They are the folks driving down the street who are focused on the potholes in front of them rather than where the road is going. Goodrich Petroleum provided an operational update today. 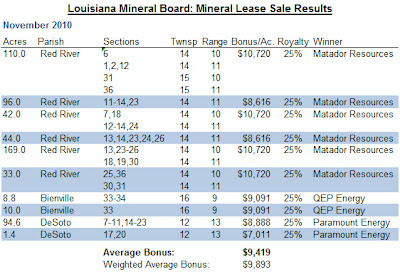 Although the company buried the news in the release, Goodrich announced that it has sold some shallow ("non-core," of course) production and reserve acreage in east Texas and north Louisiana to an unnamed private company buyer for $70 million. Goodrich retained the deep rights to the acreage. Proceeds from the sale along with operating cash flow will fund the "vast majority" of the company's 2011 capital program. In my opinion, it is always a potentially slippery slope when a company sells production and prospects to fund short-term capital needs. But if they got a good price (there was too little information in the release to tell) and the deeper prospects are a better opportunity, then it likely is a good (enough) deal. S.W. Henderson #1H: 21.0 MMcf/day IP on 22/64" choke at 10,250 psi; Angelina Co. These days, it's easy to be down about natural gas. The commodity price is very low, unsustainably low. Gas rig counts haven't budged as prices keep dropping. Demand just hasn't picked up as expected as the economy creeps along towards recovery. A comprehensive energy policy that would have made gas more attractive got caught in a political thresher and doesn't appear to have much of a future as leadership potentially changes hands in Washington. Weather experts are predicting a warm winter. The list goes on. All of these things point to a bleak short-term outlook for natural gas. But the long-term outlook is improving as we start to see hopeful signs. The good news is that change is coming. The bad news is that it doesn't seem to be in a hurry to get here. Work is underway to build a new compressed natural gas fueling station in Lafayette, Louisiana. The station is being built by the city to support five new natural gas-powered buses that are scheduled to arrive by July. The station will be a public works facility, but it will be open to the general public. Nearby Baton Rouge already has three CNG stations open to the public. This new station is another step in the slow chicken and egg process of creating natural gas vehicle fueling infrastructure. As fleets adopt CNG to improve economics and lessen their environmental impact, a CNG fueling infrastructure will be built in pieces. As the gaps fill in, it will be considerably easier for the public to own natural gas vehicles. It won't be fast, and it might not be pretty, but the process seems to be starting in earnest. Jenk-Hazb Gas Unit 1 #2H, Berry Oil: 10.909 MMcf/day IP, 18/64" choke; Carthage Field (Haynesville Shale), Harrison Co.
H. Nelson #1 H, Goodrich; Carthage Field (Haynesville Shale), Nacogdoches Co.
Beasley Fed #1 H, Chesapeake Operating; Carthage Field (Haynesville Shale), Shelby Co.
Cyclones DU #1 H, XTO Energy; Carthage Field (Haynesville Shale), Shelby Co. When I predicted last week that we would see some buyouts of independent natural gas focused E&P companies last week, I didn't think it would happen this fast, but... EXCO Resources announced today that it has received a buyout offer from its Chairman and CEO Douglas Miller. Miller has had discussions with Oak Tree Capital Management, Ares Management and T. Boone Pickens, all significant current investors in EXCO, about partnering in Miller's offer of $20.50 per share for EXCO. The company closed at $14.83 on Friday. It has traded as high as $22.52 this year, back in January. This is a very interesting move. As I stated last week, it is a mixed blessing for shareholders. The offer represents a 38% premium, but does it really express a true valuation for the company? One of the first rules of marketing is that the only valid definition of "price" is amount the market is willing to pay for a particular good. The stock market is woefully short-sighted (even more so these days now that most trading activity is flash trading that pays little consideration to a company's true long-term value) and the market tends to value a company based on short-term metrics.